Sylvan Ebanks-Blake scored his 10th goal of the season. 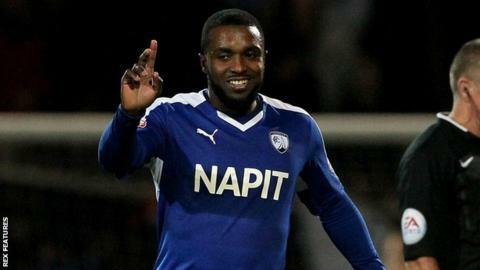 Goals from Sylvan Ebanks-Blake and Lee Novak saw strugglers Chesterfield upset high-flying Gillingham in League One. Ebanks-Blake tapped in Gboly Ariyibi's cross to open the scoring, before Novak doubled the Spireites' lead deep into first-half stoppage time with a thunderous strike from range. Emmanuel Osadebe pulled one back for Gillingham before Rory Donnelly missed an opportunity to salvage a point. Wigan's win over Bury sees the Gills drop four points behind the Latics. Wigan are currently second in League One after a 12-game unbeaten run, while Gillingham stay third. Match ends, Gillingham 1, Chesterfield 2. Second Half ends, Gillingham 1, Chesterfield 2. Attempt saved. Aaron Morris (Gillingham) right footed shot from outside the box is saved in the centre of the goal. Corner, Gillingham. Conceded by Lee Novak. Attempt missed. Ryan Jackson (Gillingham) left footed shot from outside the box is too high. Attempt missed. Rory Donnelly (Gillingham) header from the centre of the box is just a bit too high. Substitution, Chesterfield. Jay O'Shea replaces Oliver Banks. Goal! Gillingham 1, Chesterfield 2. Emmanuel Osadebe (Gillingham) header from the centre of the box to the centre of the goal. Assisted by Luke Norris. Attempt missed. Declan John (Chesterfield) left footed shot from outside the box is close, but misses to the left. Corner, Gillingham. Conceded by Thomas Lee. Attempt saved. Luke Norris (Gillingham) left footed shot from outside the box is saved in the top centre of the goal. Corner, Gillingham. Conceded by Sam Hird. George Williams (Gillingham) wins a free kick on the left wing. Foul by Oliver Banks (Chesterfield). Foul by Bradley Garmston (Gillingham). Gboly Ariyibi (Chesterfield) wins a free kick in the attacking half. Substitution, Chesterfield. Dion Donohue replaces Sylvan Ebanks-Blake. Corner, Chesterfield. Conceded by Adam El-Abd. Substitution, Gillingham. Luke Norris replaces Dominic Samuel. Attempt missed. Adam El-Abd (Gillingham) right footed shot from outside the box misses to the right. Attempt missed. Lee Novak (Chesterfield) right footed shot from the right side of the box misses to the left. Hand ball by Liam O'Neil (Chesterfield). Sylvan Ebanks-Blake (Chesterfield) wins a free kick in the defensive half. Attempt saved. Dominic Samuel (Gillingham) header from the centre of the box is saved in the top centre of the goal. Rory Donnelly (Gillingham) wins a free kick in the defensive half. Foul by Sam Hird (Chesterfield). Foul by Dominic Samuel (Gillingham). Oliver Banks (Chesterfield) wins a free kick in the defensive half. Sam Hird (Chesterfield) wins a free kick in the defensive half. Attempt saved. Ryan Jackson (Gillingham) header from the right side of the six yard box is saved in the bottom right corner. Second Half begins Gillingham 0, Chesterfield 2. Substitution, Gillingham. Bradley Garmston replaces Adam Chicksen. First Half ends, Gillingham 0, Chesterfield 2. Goal! Gillingham 0, Chesterfield 2. Lee Novak (Chesterfield) right footed shot from outside the box to the high centre of the goal. Assisted by Tom Anderson. Attempt missed. Dominic Samuel (Gillingham) right footed shot from outside the box is close, but misses to the left.